For the past several years there has been so much discussion around employee engagement that you may be growing tired of the term. Yet, the facts are hard to ignore. Companies with highly engaged employees consistently outperform those without. Much less clear, however, is what HR departments can do to influence engagement in a strategic manner. Does your company have a cohesive strategy in place for improving employee engagement throughout the talent lifecycle? 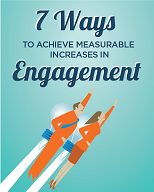 Our latest eBook, 7 Ways to Achieve Measurable Increases in Engagement, offers practical ideas for building an engagement strategy that will help you align HR initiatives more closely with enterprise objectives to improve recruitment, performance and retention. Our engagement experts here at Engage2Excel can help you design, manage and implement an engagement strategy that includes industry-leading solutions for engagement surveys, employee recognition, talent acquisition and onboarding. To schedule a discovery call, click here.